With Hawaii being in the news so much recently, you would be forgiven for thinking that it might be off limits. But with the Hawaii Volcano National Park Reopening this weekend (September 22nd, 2018), now is a perfect time to plan to visit these paradise islands. A guest house we love and situated on the Island of Hawaii, about an hour from the Volcano National Park, is the stunning Horizon Guest House. We highly recommend this beautiful location for your Hawaii Visit. Horizon Guest House is an elegant, exclusive resort situated on over 40 acres of sloping pasture lands (1,100 ft. elevation) on the side of Mauna Loa. 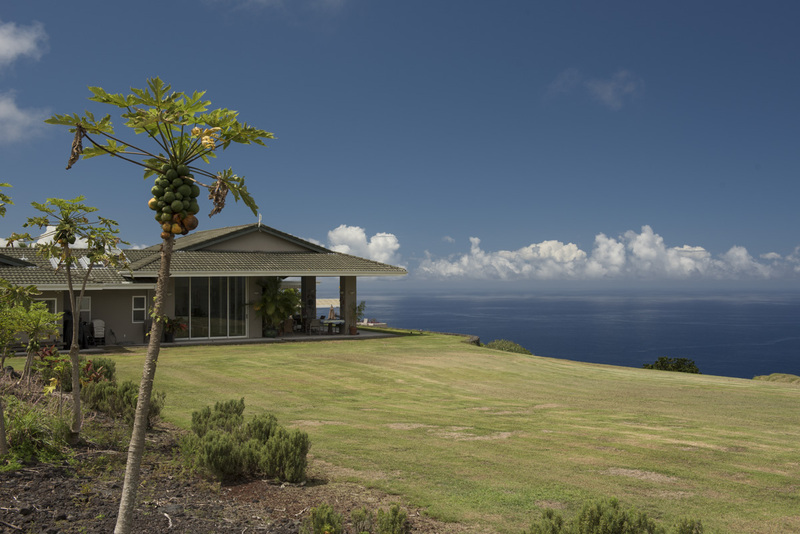 Situated on the Kona Coast, surrounded by McCandless Ranch, (15,000 acres) ensuring exquisite privacy and tranquility. You will experience the warm ocean breezes during the day and the cool breezes off the slopes of Mauna Loa during the night (yes, it switches direction twice each day). Enjoy the magnificent panoramic view from every part of the resort, including the custom designed”Infinity Edge” swimming pool and built in Jacuzzi Hot Tub. When you stay at Horizon Guest House, you will enjoy a generous buffet breakfast in the dining room, main lanai (Hawaiian for patio), pool-side, or even on your private lanai. Wherever you chose, all have magnificent Kona coastline views. Picnic coolers and ice are provided for you to take on your adventures around the island. Enjoy the local restaurants or use the outdoor gas barbecue grill to prepare your own dining adventure. There are four suites to choose from. Each of the suites has its own bathroom and lanai. They are arranged in a staggered wing, ending in a guest utility-laundry room at the end. All suites have their own private entry and private lanais with sweeping coastline views looking west, a sunset opportunity! One suite (the honeymoon suite) has a queen bed, the other three have king beds. A refrigerator is provided for late night snacks, or to store those island produce treasures you discover on your driving adventures! Also, there’s a coffee press and electric kettle for early morning “private” coffee or tea, and a ceiling fan, although there is usually a cool, gentle, evening breeze coming down the mountain from the upper slopes of Mauna Loa.